These are exciting times for the Northwest Indiana Building and Construction Industry. Recent innovations in construction technology have been revolutionary, affecting change in control systems. Work practices are becoming increasingly more technical and specialized. Environmentally sensitive green construction methods and renewable energy technologies also are driving demand for a more highly skilled workforce. The building and Construction Industry increasingly needs skilled construction and maintenance professionals who can meet the challenges of this new exciting marketplace! We welcome you to explore the various career opportunities available in the northwest Indiana construction industry. We also welcome you to like us on Facebook, Twitter, and Instagram as we will frequently post updates, job postings, apprenticeship application periods, photographs, and industry news. 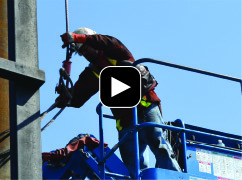 Get a glimpse into the construction workers career and see if the trades are right for you!